Listed below are the pure ranks of manga series from WSM. The eight week rule that WSJ follows was used to work out the ranks. Colour pages are excluded from the ranks. Please note there are no readers survey like in WSJ. Please also note that Chotto Morimashita, Rupodama! and Sagashite Choudai MY Shoten have been excluded from the ranks as it has a permanent position (last place) within the magazine; however if it has colour pages or a special placement in the magazine it will be listed. 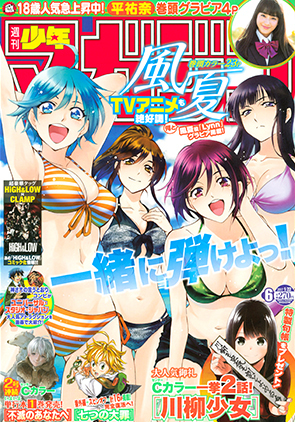 Seitokai Yakuindomo×Senryuu Shoujo×Tsurezure Children -Valentine Crossover is also included in this issue. Universal Studios Japan × Kamisama no Iuutori II special collaboration information is included in this issue. A special chapter of Nanatsu no Taizai - King no Manga Michi from Magazine SPECIAL is also included in this volume. Mononote: Edo Shinobi Kagyou was moved to Magazine Pocket. Three Oneshots are also included in this issue, these are: Ohayou。Asagao-san! ; Sabdoll ; Otome no Kiwami . Hiatus: Nanatsu no Taizai (Returns in issue 7). 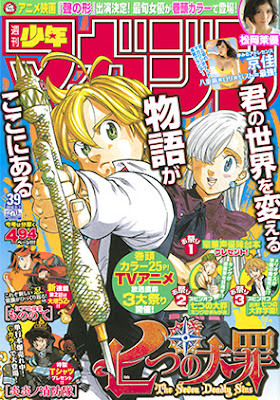 Nanatsu no Taizai Side Stories will run until the series returns. 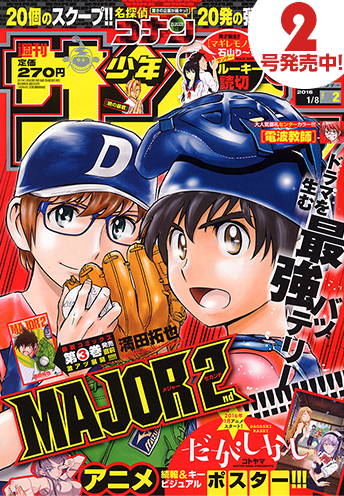 Koisuru Suizoku-man major arc ends in this issue, and it will return in January. Kono Ken ga Tsuki o Kiru was moved to Magazine Pocket. A one Shot titled 'Actors High' is also included in this issue. 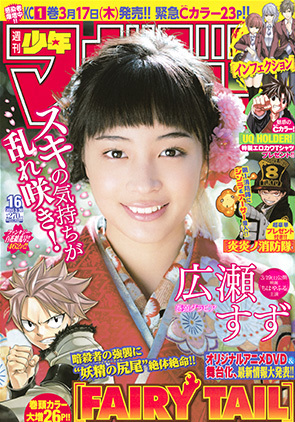 A special chapter of Hone ga Kusaru made from MangaBox is also included in this issue. 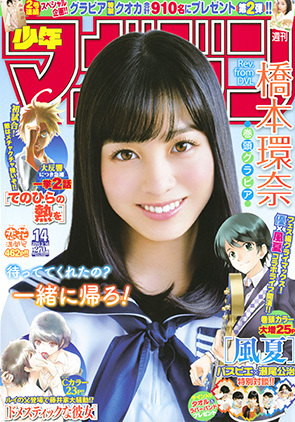 A special chapter of Tejina Senpai from Young Magazine is also included in this issue. 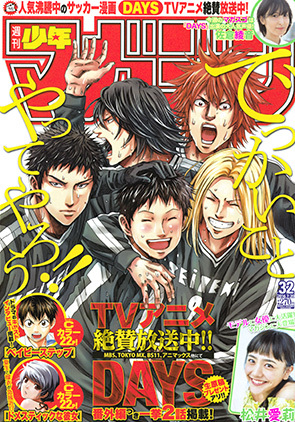 Two special chapters of Nanatus no Taizai are also included in this issue. Nanatsu no Taizai - King no Manga Michi from Magazine SPECIAL, and Mayoe! Nanatsu no Taizai Gakuen! 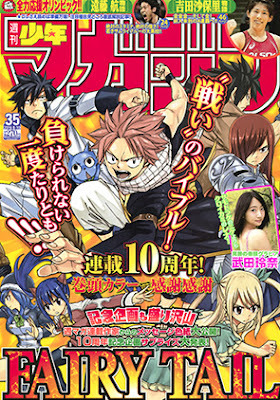 from Bessatsu Shonen Magazine. 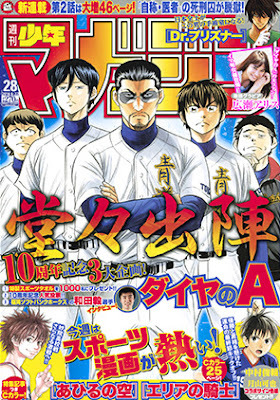 A sidestory of Tsubasa, and a special chapter of Gang King are also included in this issue. 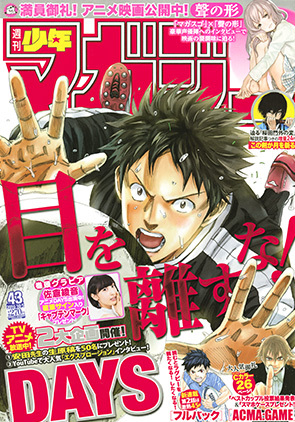 Oneshot Wataru Endou Monogatari is also included in this issue. 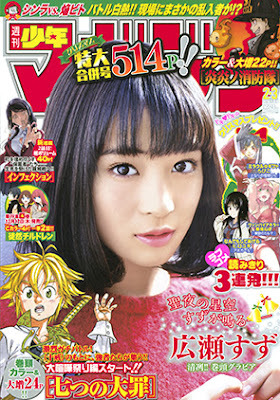 A special chapter of Kakushigoto from Gekkan Shonen Magazine is also included in this issue. Monthly series Sagashite Choudai MY Shoten is included in this issue. 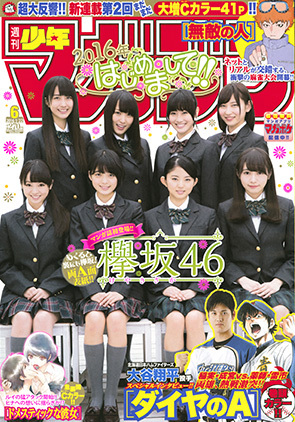 Tenohira no Netsu o has been transfered to Magazine Pocket. Monthly series Sagashite Choudai MY Shoten is also included in this issue. A special chapter of Kin no Tamago from Betsumaga is also present in this volume. Absent: Daiya no Ace, Kindaichi Shounen no Jikenbo R and Rupodama! 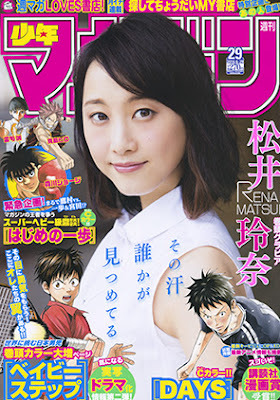 Monthly series Sagashite Choudai MY Shoten, and a special chapter of Shingeki no Kyojin - Lost Girls from Betsumaga are both included in this issue. Absent: Domestic na Kanojo, Real Account and UQ Holder! Special Chapter of Aho Girl from Betsumaga is also included in this issue. Monthly series Sagashite Choudai MY Shoten also features in this volume. 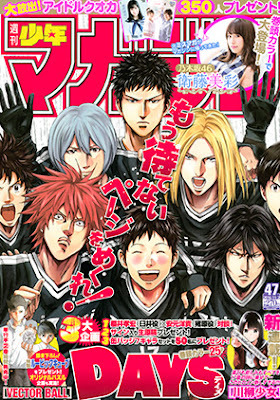 Oneshot Riajuu no Shoutotsu is also included in this issue. Absent: Kindaichi Shounen no Jikenbo R and Rupodama! Absent: Ahiru no Sora and UQ Holder! NEW Monthly series Sagashite Choudai MY Shoten started in this issue. Absent: Hajime no Ippo and Rupodama! 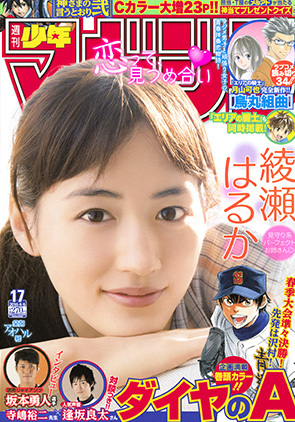 A special chapter of Sentirental Shoujo from MangaBox is also included in this issue. A special chapter of Air Gear Fukkatsusai is also inlcuded in this issue. A special chapter of Shingeki! Kyojin Chuugakkou from Betsumaga is also inlcuded in this issue. Hi, you wrote that "there are no readers survey like in WSJ". So, which method do you use to make the rankings of WSM and WSS? Are they based on a personal taste, or they're based on unofficial but reliable surveys? I used the eight week rule that WSJ follows. These WSM rankings just give a vague idea on the layout and the popularity of the series. does the ranking represent the chapter that was release on the same week or the week before? I used the 8 week rule. So the ranking here represent the chapters from 8 issues (weeks) before. 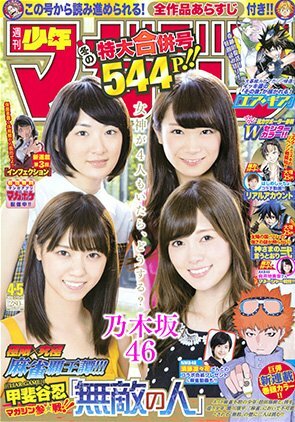 Why do the Weekly Shonen Magazine and Weekly Shonen Sunday use models, actresses and/or singers for their covers? 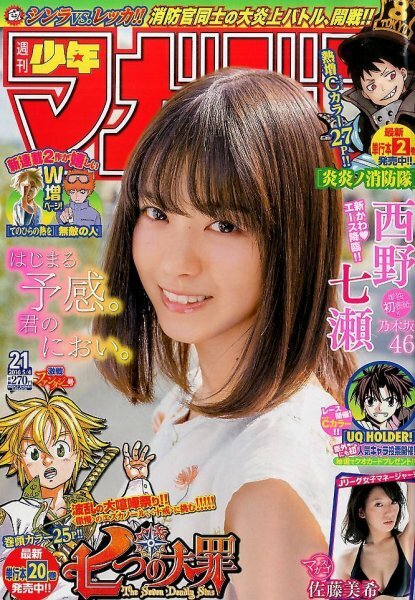 I've never seen the Weekly Shonen Jump do this... Wouldn't it be much better to just let their actual manga series dominate the covers? That is a deep, complicated and long-standing question. First of all, you have to remember that the readers of these two magazine fall under the male high school or college student demographic. So in a way this is to attract these male readers. WSM and WSS are not the only magazines in Japan that have Models or Gravure Idols on their cover, so it is nothing new for the Japanese. Having models on the cover also saves mangakas (manga authors) time from doing cover artworks. They can concentrate on their series plot and artwork (This is more of an excuse in my opinion). It also furthers the models career as she can become popular with the readers. Your question is one I have seen many times. Although I might agree with your statement in that it would be better to let the manga series "dominate" the covers it is also a way to identify that particular magazine, and it adds some diversity to that genre of magazines. You might want to note that WSM do not have Models or Gravure Idols on their cover in the digital versions. I lightly went over everything but you get the idea. I might do a Blog post on this subject in the future because it is a re-occurring question. 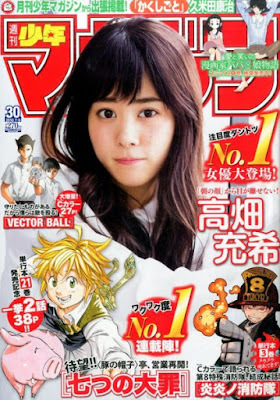 One last thing I want to state is that Weekly Shonen Magazine was the most popular shonen magazine in Japan until Dragon Ball begain running in WSJ. So the models do not really impact the magazines popularity as much.